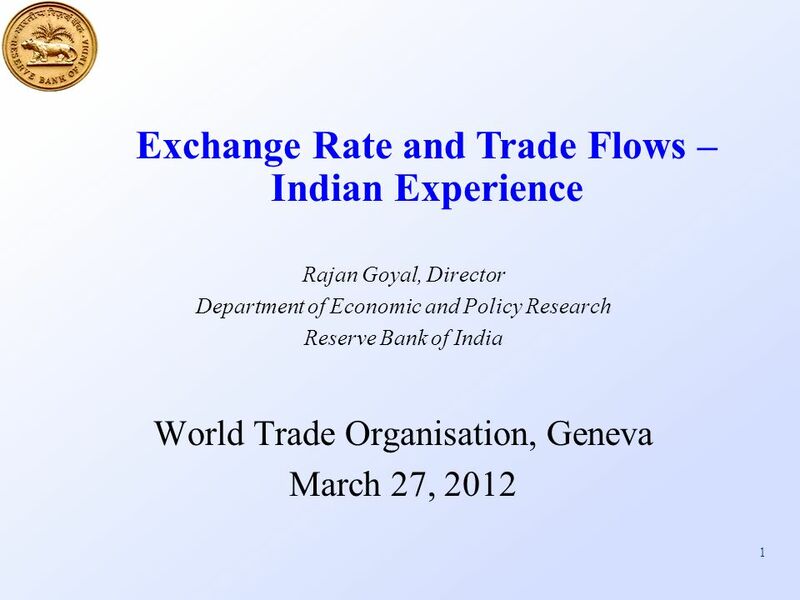 1 Rajan Goyal, Director Department of Economic and Policy Research Reserve Bank of India World Trade Organisation, Geneva March 27, 2012 Exchange Rate. 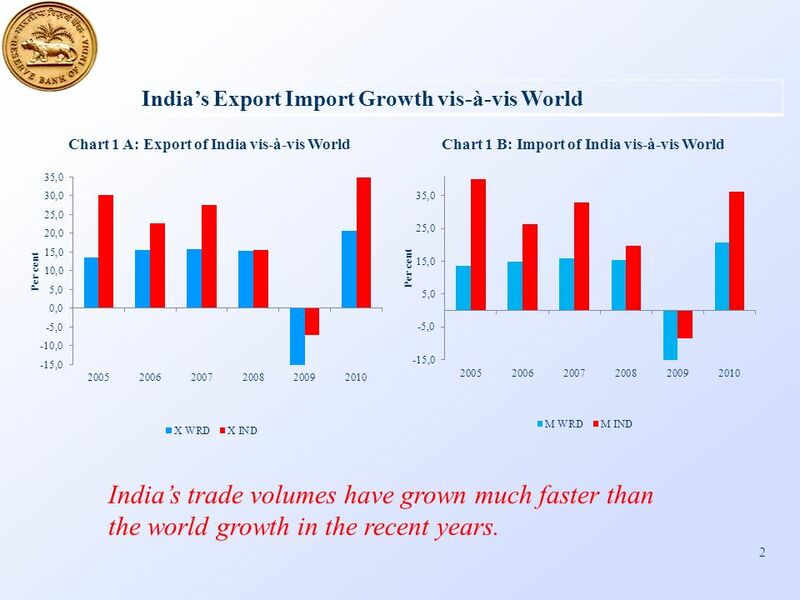 2 2 Indias Export Import Growth vis-à-vis World Indias trade volumes have grown much faster than the world growth in the recent years. 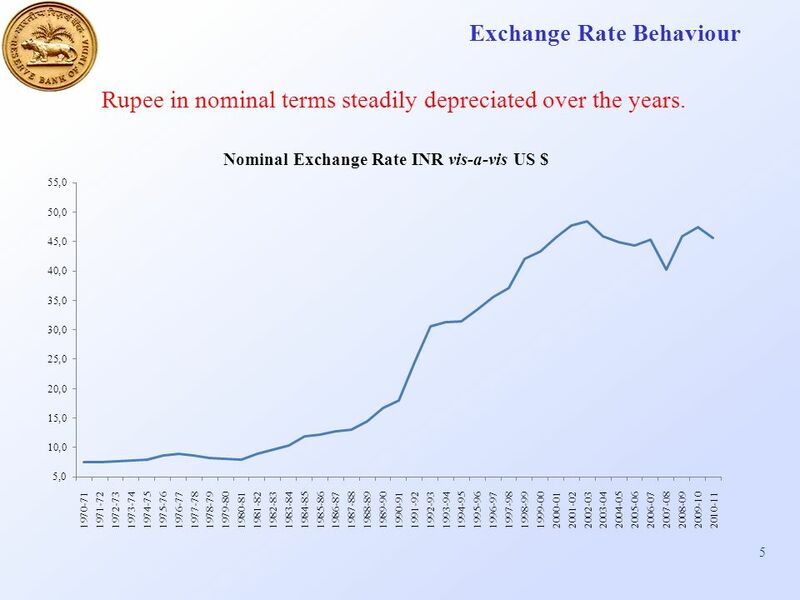 5 5 Exchange Rate Behaviour Rupee in nominal terms steadily depreciated over the years. 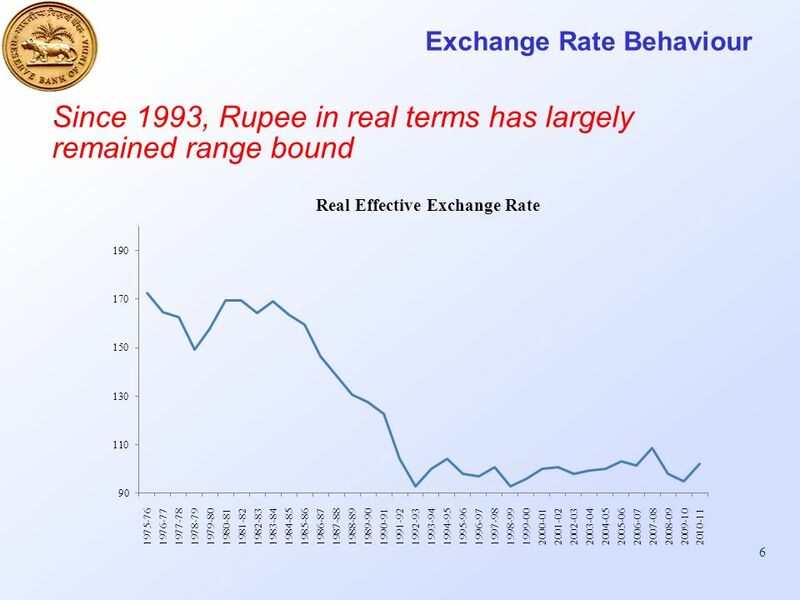 10 10 Behaviour of Exchange Rate Rupee was overvalued and administratively pegged prior to 1993. 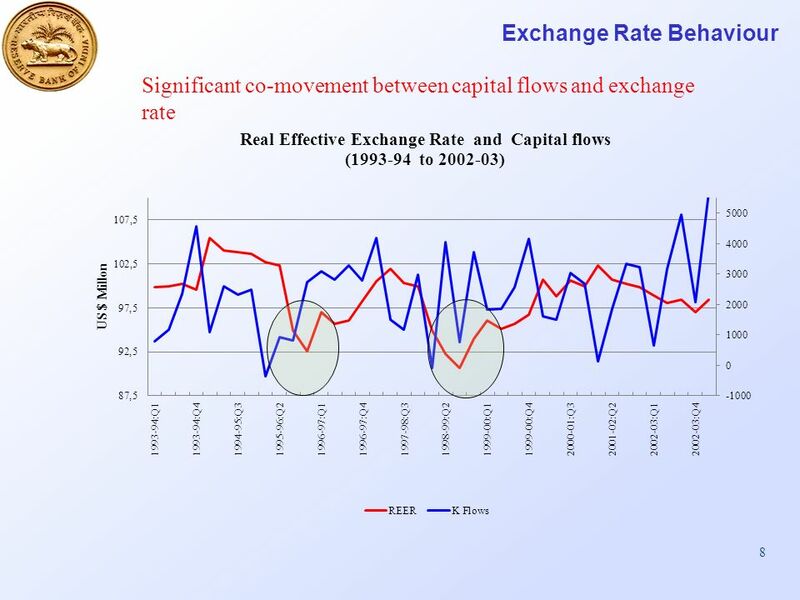 Since 1993, movement in nominal exchange rate are largely reflective of inflation differential. 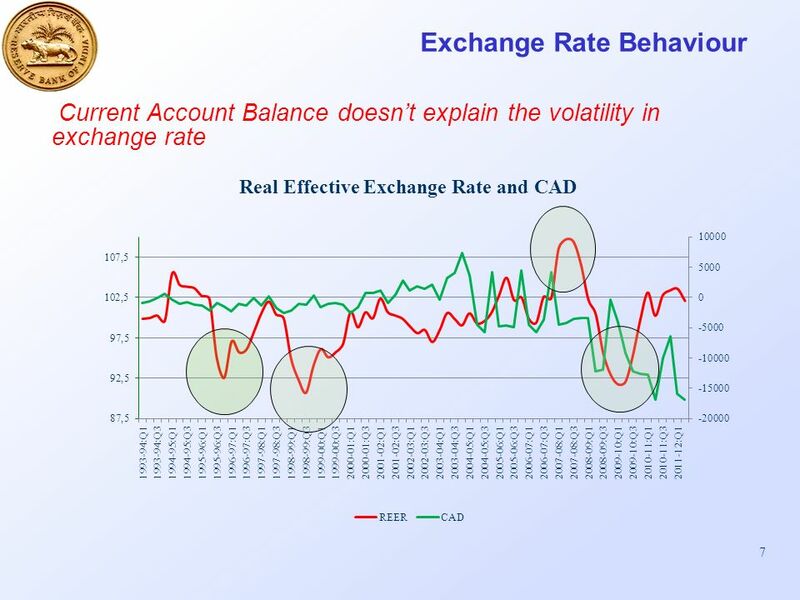 Accordingly, real effective exchange rate has remained close to base level and movements have been largely range bound. 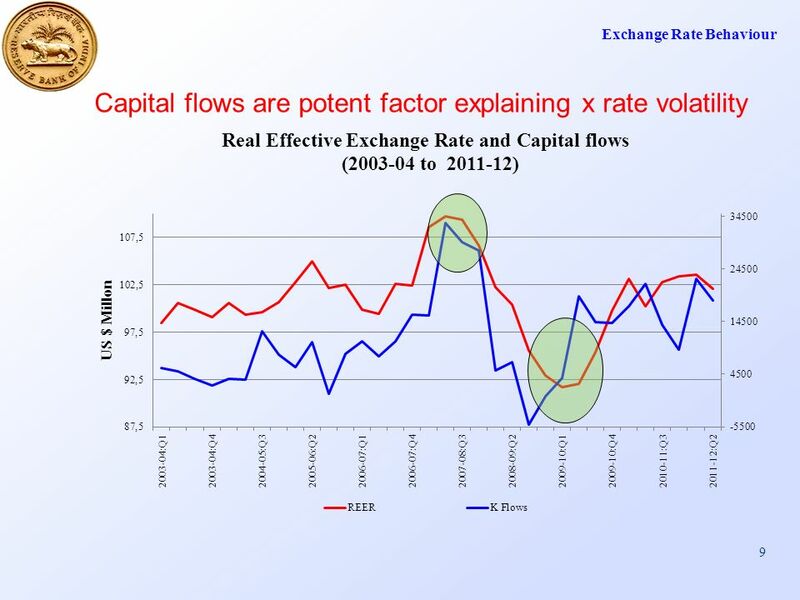 Large variations in capital flows tend to cause exchange rate volatility. 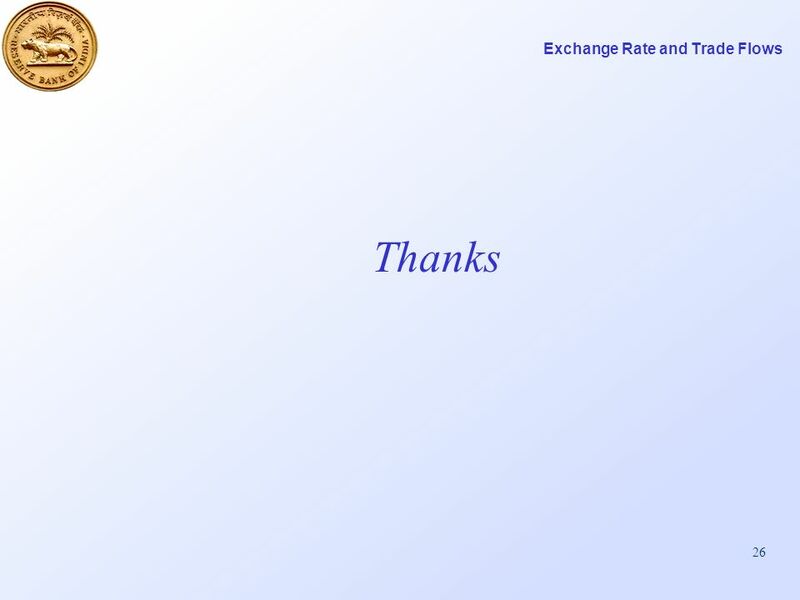 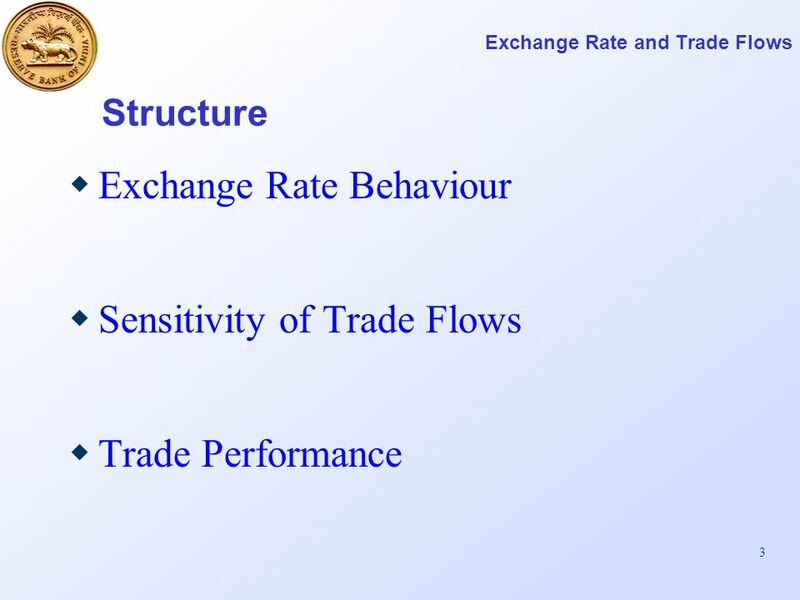 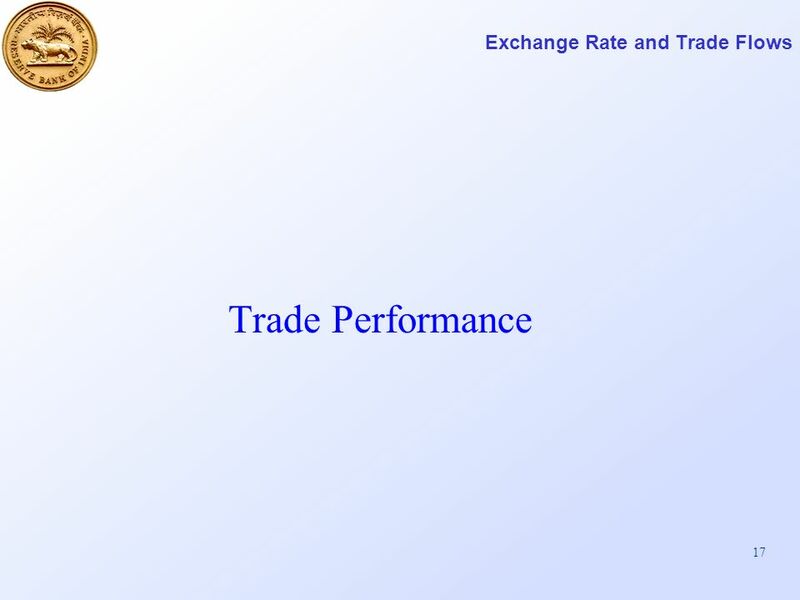 Movements in exchange rate are reflective of market conditions. 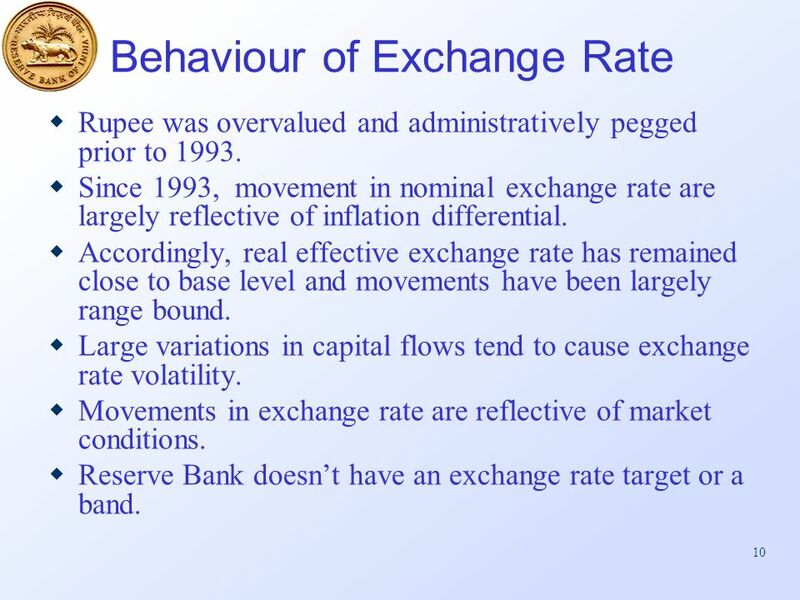 Reserve Bank doesnt have an exchange rate target or a band. 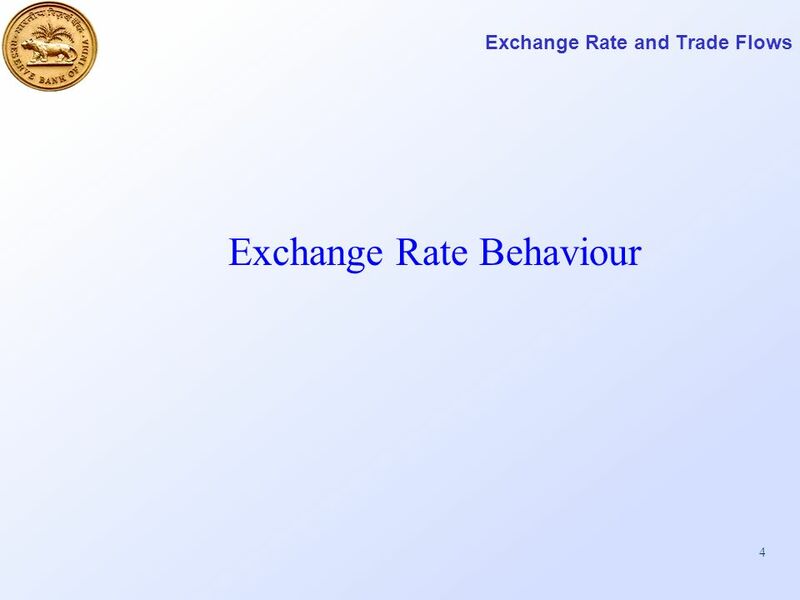 11 11 Exchange Rate Behaviour Whether Exchange Rate is fairly valued? 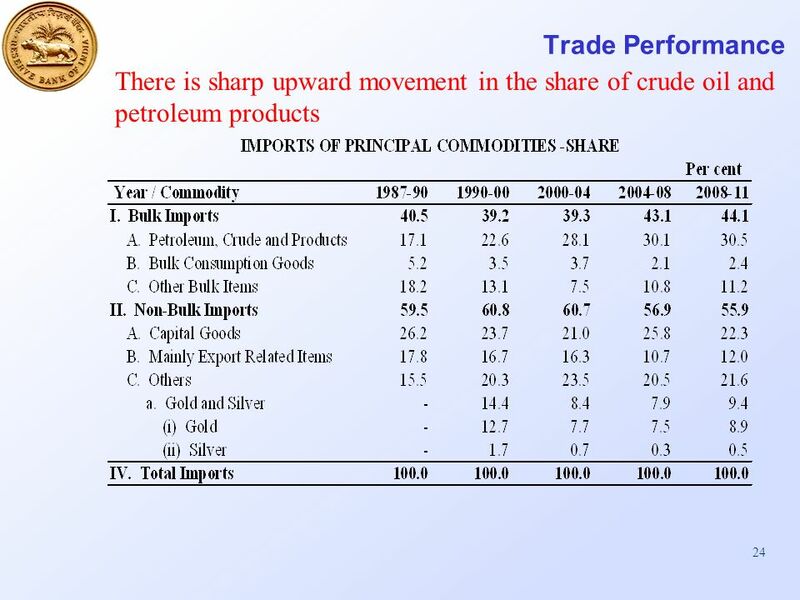 3 Methodologies: Real Effective Exchange Rate Sustainable level of CAD Macro Balance Approach Growth differential Demography Oil balance Stage of development Fiscal deficit No clear message. 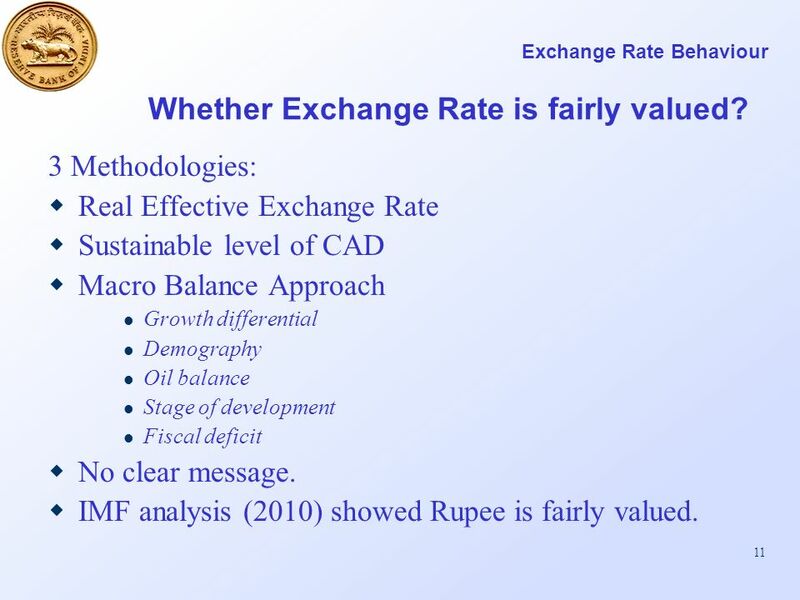 IMF analysis (2010) showed Rupee is fairly valued. 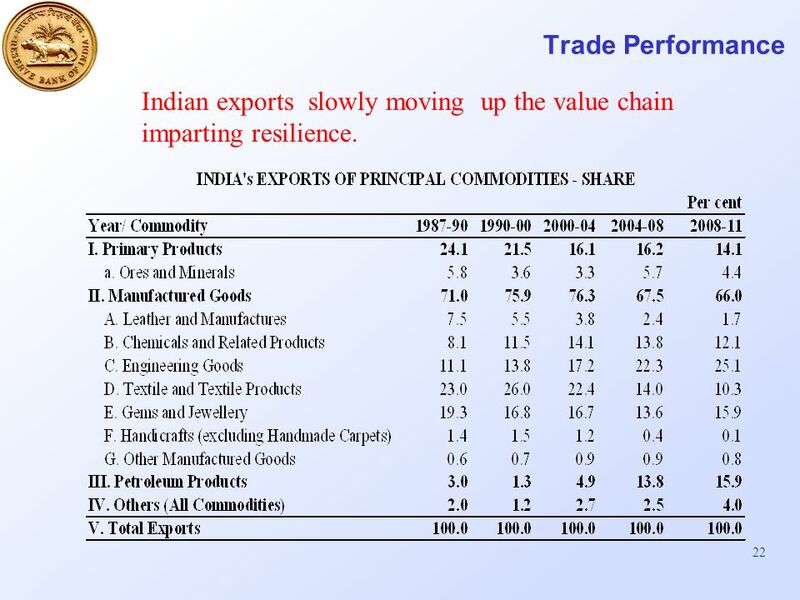 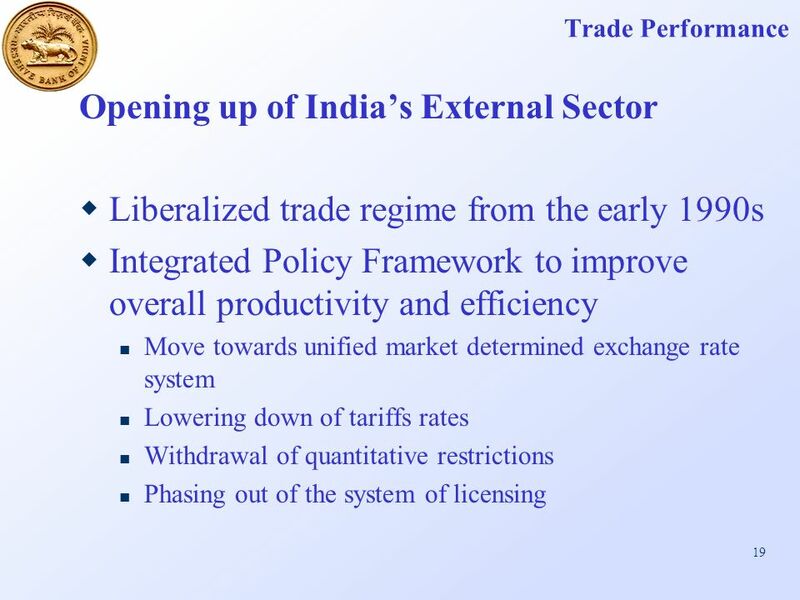 22 22 Trade Performance Indian exports slowly moving up the value chain imparting resilience. 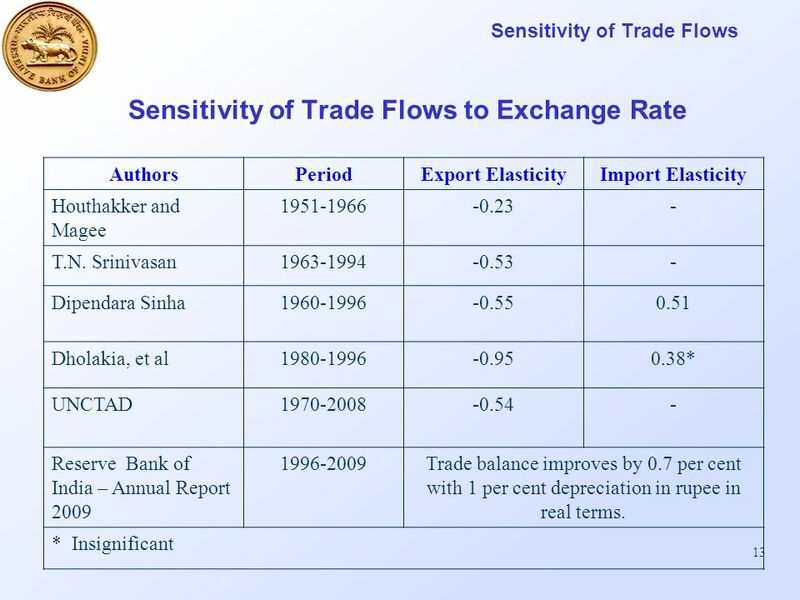 25 25 Exchange Rate and Trade Flows Key Messages Rupee in real terms has generally remained stable and close to its base level. 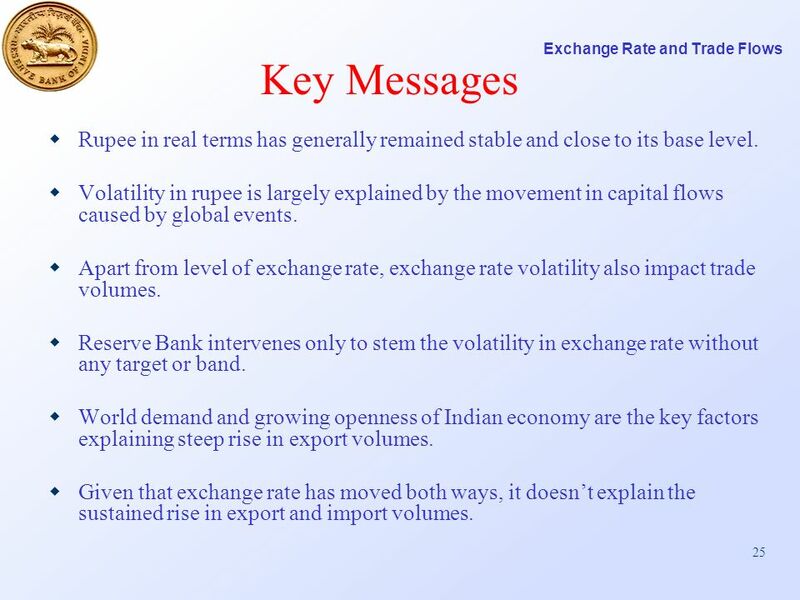 Volatility in rupee is largely explained by the movement in capital flows caused by global events. 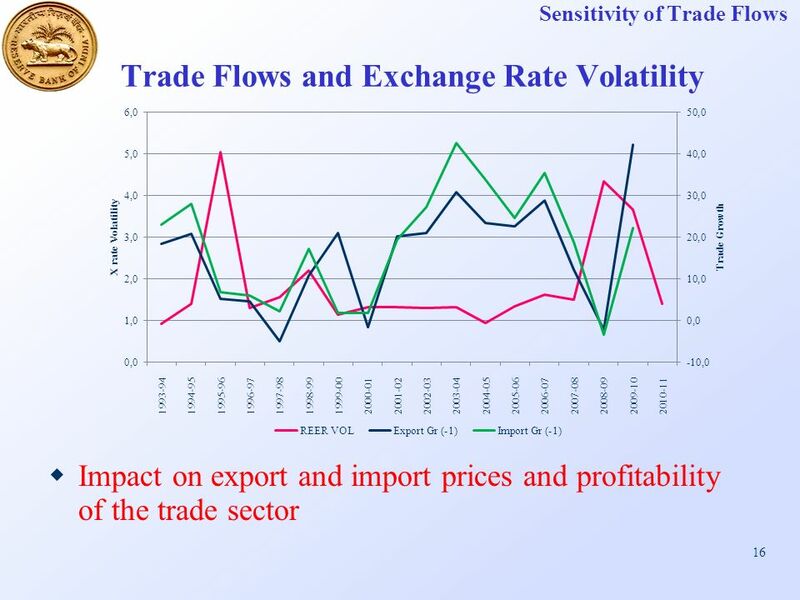 Apart from level of exchange rate, exchange rate volatility also impact trade volumes. 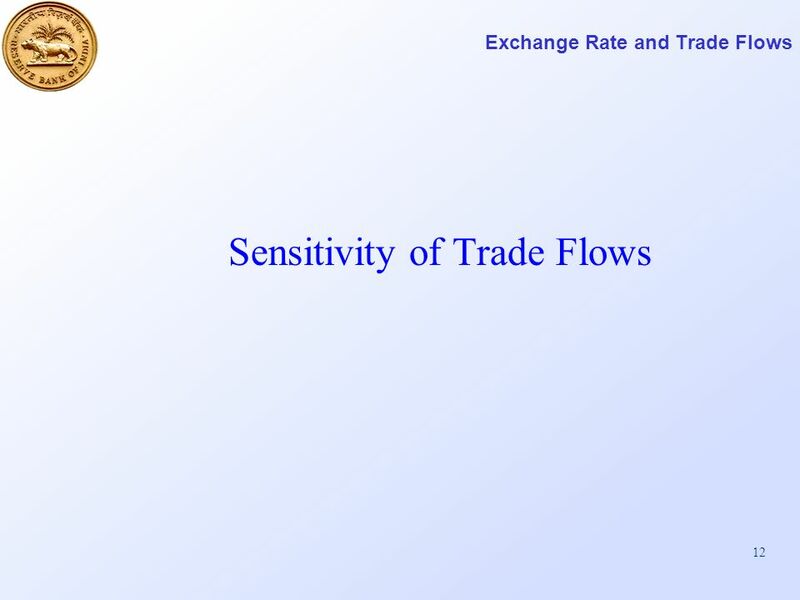 Reserve Bank intervenes only to stem the volatility in exchange rate without any target or band. 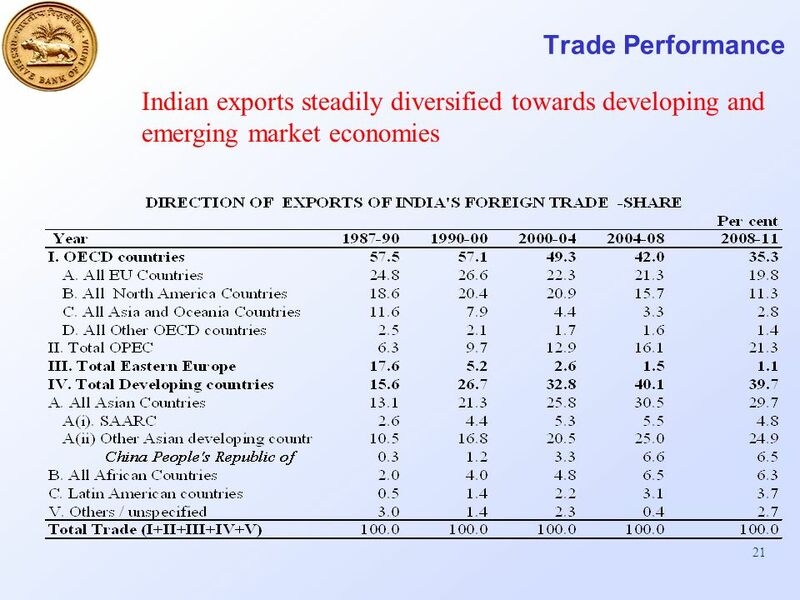 World demand and growing openness of Indian economy are the key factors explaining steep rise in export volumes. 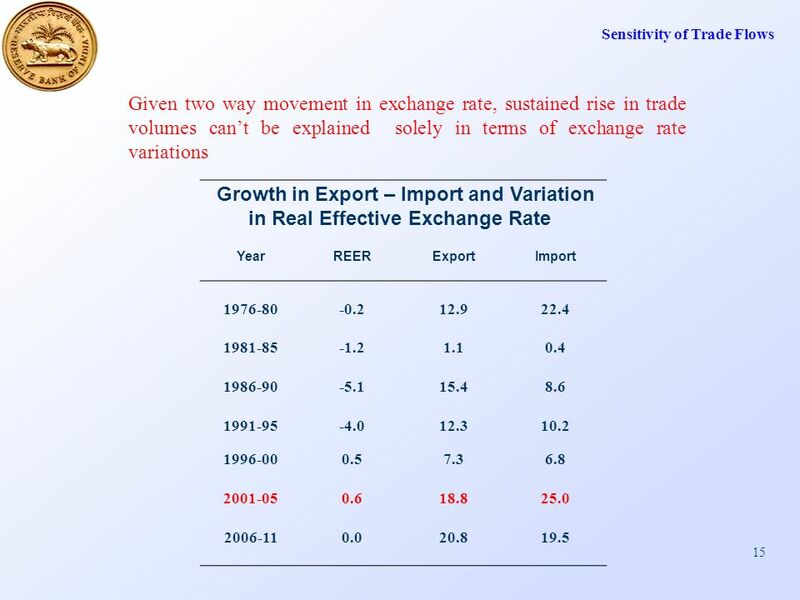 Given that exchange rate has moved both ways, it doesnt explain the sustained rise in export and import volumes. 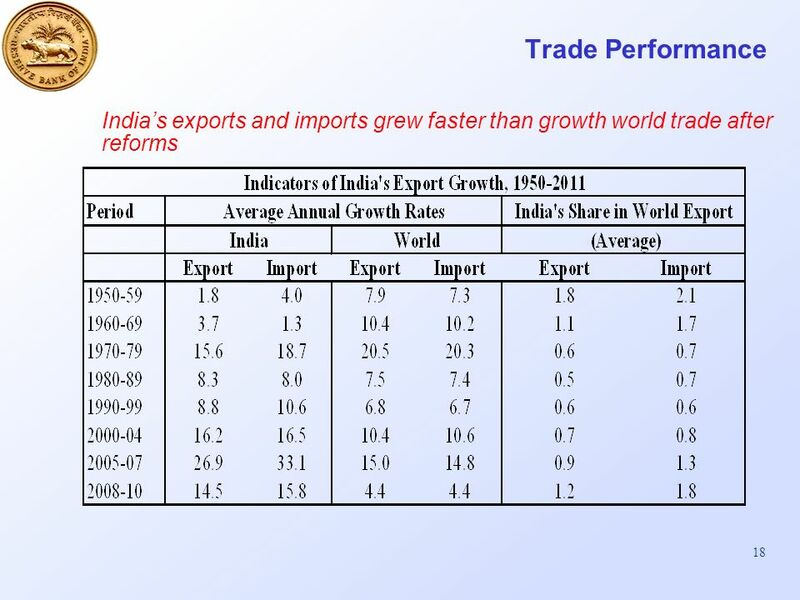 Download ppt "1 Rajan Goyal, Director Department of Economic and Policy Research Reserve Bank of India World Trade Organisation, Geneva March 27, 2012 Exchange Rate." 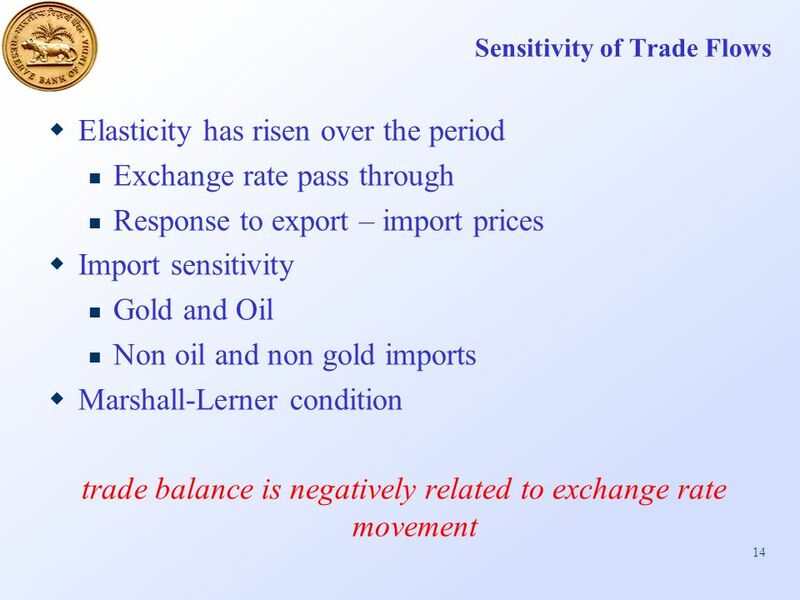 Price Adjustments and Balance-of- Payments Disequilibrium Copyright © 2010 by The McGraw-Hill Companies, Inc. All rights reserved.McGraw-Hill/Irwin Chapter. 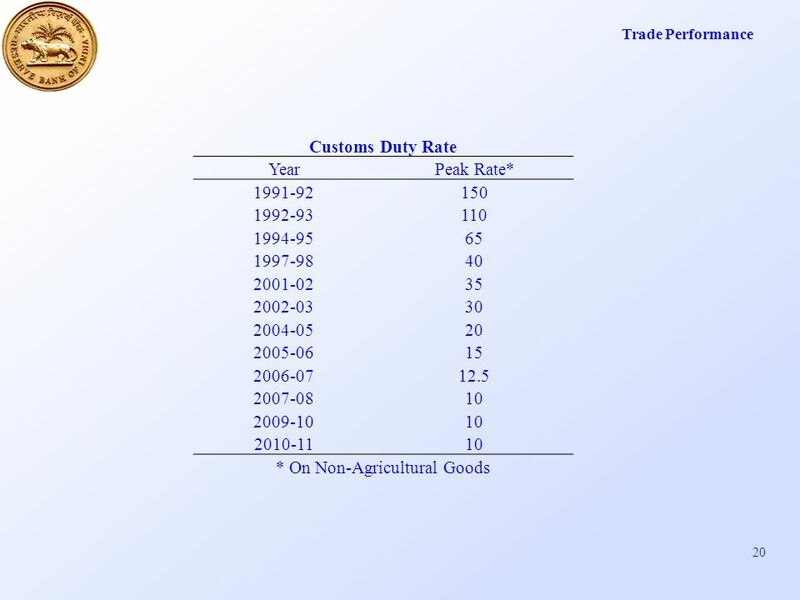 1 New patterns of economic growth in developing economies Noemi Levy-Orlik UNAM-MEXICO January, 2007. 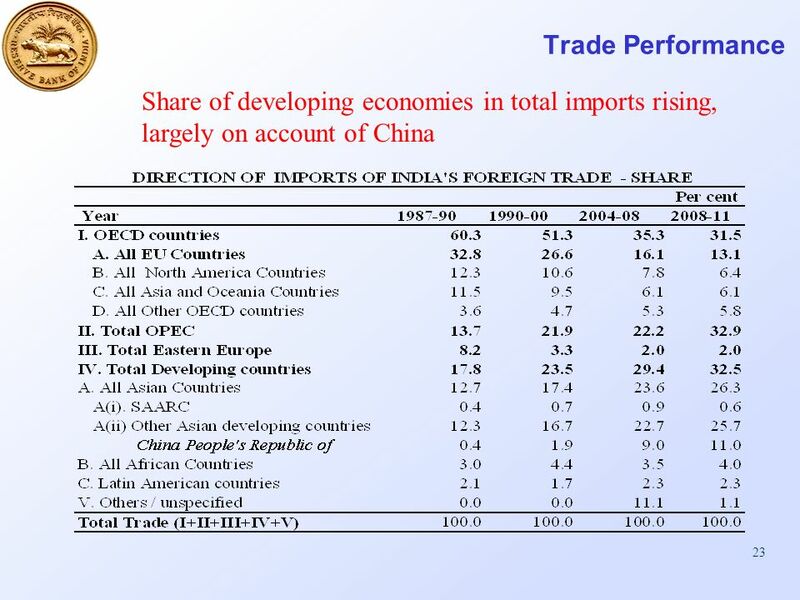 Chinas role in Globalisation Martin Wolf, Associate Editor & Chief Economics Commentator, Financial Times Leverhulme Centre for Research on Globalisation.